Years ago, cellphones could do little more than simply call out. Turn the clock ahead to today, and people hardly use their phones to call at all. Instead, thanks to the invention of the smartphone, they text, Vox, play games, watch movies, and browse the Internet. With the array of features and apps available on phones, comes what seems to be a constant rise of your cell phone bill as well. Cellphones are often riddled with fees and chargers for a variety of things that all rack up your bill quickly. Nonetheless, most of us would rather not portion out a large part of our budgets for our cellphone bill. If you’re looking to lessen what you pay each month, consider these 7 ways to save on your cell phone bill. Like with any service or purchase you make, it’s always a good idea to shop around before fully committing to a plan. And even if your plan at one time was the better option, it might be a good idea after a year or two to reexamine your cellphone plan and its costs and compare it with others. Sites like WhistleOut and MyRatePlan allow you to enter an average of the texts, date, and minutes you use within a month, and how many lines you use, and then helps you compare and contrast various plans to find the one best for you. Moreover, make sure your cellphone plan is the one that works best in the area you live. While you might have access to every network, sometimes some work better in various cities than others, and choosing the best one can help keep you from roaming. When you’re picking a plan, it’s easy to think the more data, the better. Of course, the more data included within your plan, the more expensive your cell phone bill is going to be. Before opting for a certain data plan, track how much data you actually use. Apps like Data Tracker can help you do this so you’re not just guessing in the dark. Because if you mostly use wi-fi, but still have a large monthly bill, you’re likely paying for more data than you need. On the other hand, if you’re constantly going over your data plan, it can be a good idea to track your usage so you know how much more data you really need to buy. Furthermore, before switching your carrier in favor of another, be sure to see if your current one provides an current promotions or deals for upping your data amount. If you’re like most people, you’ve probably had some time or another when you’ve either cracked, broken, or gotten your phone wet to the point where it no longer works. Hence, the enticement of cellphone insurance. However, if your phone is older or already fully paid off, phone insurance might not be worth the extra fee on your cell phone bill. Before you simply agree to pay for cellphone insurance, carefully look over the policy and everything it covers. Then decide if it’s something that’s really worth the extra cash. This might seem counterintuitive since it’s how most cellphone companies work, but opting to go contract-free with a company like Straight Talk can help save you big in the long run. By doing so, you purchase your phone separately and then simply pay your provider for their month-to-month carrier service instead. While you might pay more upfront initially for the phone, unless of course you shop around and opt for a gently used one, you’ll still save because you won’t be paying more each month for both the phone and plan. Moreover, should you ever want to cancel, you won’t be forced to pay hefty cancellation fees. Nowadays, cellphone carriers offer myriad features and add-ons to your phones and service. From more memory to technical support to GPS tracking and roadside assistance, there’s no shortage of extra services that you can sign up for. That being said, do you sincerely need all those extras? In most cases, you’ll end up paying extra for add-ons that you don’t ever use. Or they might already be covered through another provider. For example, your car might already come with prepaid AAA. Before adding anything on to your plan, take the time to sit down and really evaluate what you need and research other, third-party providers that might be able to offer a similar service at a lesser cost. A pay-as-you-go phone lets you know exactly what you’ll be charged up front. This can save you lost of money down the line. If you don’t require all the minutes standard carrier plans provide, a prepaid plan can be a great option. You won’t be locked into a contract. Plus, you’ll often find better deals on prepaid phones’ data plans than you would by signing up for a contract. Furthermore, prepaid phones are no longer outdated flip-phones, you can get prepaid plans for an array of smartphone models including the iPhone. Paying for your texts can rack up your cell phone bill rather quickly. Thankfully, there is a variety of free texting apps that are available for download that work just as well, if not better sometimes, and don’t cost you any money. Try using apps like WhatsApp or GroupMe. Or if you’d rather go a walkie talkie route, Voxer. You could drastically cut down on the cost of your texting plan. While it’s almost impossible not to have a cell phone these days, it doesn’t mean having one has to cost you a fortune. By ensuring that you have the best plan for you and recognizing not only what services and add-ons you need, but learning a few tips and tricks as well, you can create a plan that works for you and saves you money. 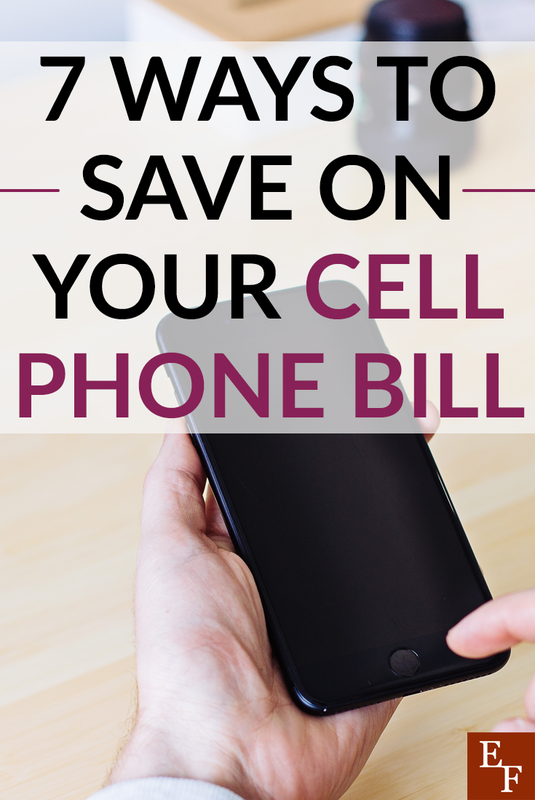 Do you find that your cell phone bill is overly expensive each month? Have you found certain networks to be superior to others in price?